The HTC Vive, despite being one of the most versatile VR headsets on the market, has always had one shortcoming – it can only track your hands. What that means is if you had a cool object you wanted to bring into the virtual world with you – like, say, a piece of furniture or something a bit crazier like a baseball bat – you’d be out of luck. But that’s about to change – HTC announced a new peripheral today called the Vive Tracker that will allow you to affix sensors to, well, pretty much anything. The unit itself looks and acts similar to the ring found at the end of the HTC Vive’s motion controllers. HTC says that it’s about 10cm in diameter and includes universal screws which would allow you attach it to nearly any camera mount. The sensor array on the HTC Vive is able to pick up where in the room the object is located and then, as long as you’ve created a rough 3D render of the object, pop it into your virtual environment. This is dependent on developers creating artwork for the object you’ve affixed the sensor to in real life, but there are pretty large implications for the product. In one example provided at a private demo at CES 2017, developers created a special camera peripheral that captured alien life forms in-game and then printed souvenir photos when you’re done with your hunt for extraterrestrial life. In this scenario the developers used a specially created peripheral (the camera) and then attached the Tracker to it in order for it to show up in the virtual world. HTC says that the Trackers have a six-hour battery life, and the company plans on giving away over 1,000 to developers in 2017. Us regular non-developer folks will be able to get our hands on a sensor starting in Q2 with a price to be determined down the road. 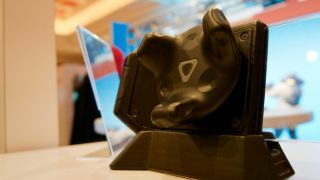 Besides the Tracker, HTC also used the captive audience at CES 2017 to announce a few other additions to the Vive ecosystem, namely the Vive Deluxe Audio Strap, and a quick update on the TPCAST accessory and a new subscription service launching through Viveport. The Deluxe Audio Strap is similar to the built-in headphones on the Oculus Rift in that they are headphones that sit on top of the ear and wrap around the head horizontally. They’re designed to be turned up and down via a wheel on the back of the headset, allowing users to adjust for maximum comfort. The Strap will also available later this year. As for TPCAST, the Chinese-manufactured peripheral that enables tetherless gameplay, HTC claims that you can expect about a two-hour battery life from its 6,000mA battery. The accessory will be available to pre-order sometime in the next few months and will launch in the Spring or late Summer of this year. You can purchase one beginning in March for $249. HTC didn’t provide any examples of what apps users could expect via the subscription service, but mentioned that it would include both traditional games as well as new genres of apps like exploration, education and creation titles.